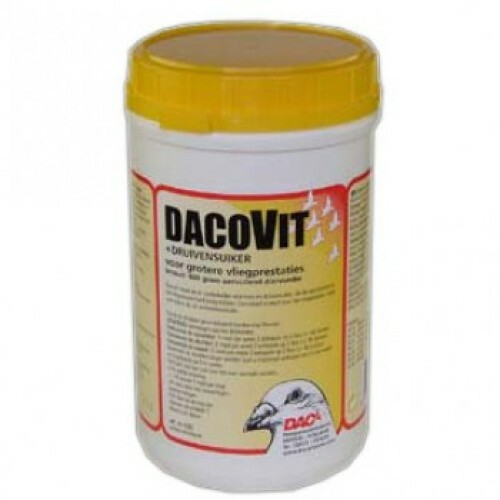 Dacovit + Dextrose 600 gr by DAC provides your birds with the essential dextrose and vitamins. This is a vital substance during the racing seasons but can also be administered during moulting and breeding seasons. - Excellent for recovery after racings. - Speeds recovery from loose and eliminates the psychological effects of fatigue. - Middle Distance- Twice a week 2 tablespoons in 2 litres of fresh water, quantity for 40 pigeons. - Long Distance- Three times a week 3 tablespoons per 2 litres of fresh drinking water. It is also possible to add DACOVIT into the pigeons feed in the same dosage (40 Pigeons once a day). You must wetten grain prior to mixing Dacovit with feed. - During Moult/Winter: Once a week 2 tablespoons in 2 litres, approx 40 pigeons. It is also possible to add DACOVIT into the pigeons feed in the same dosage (40 Pigeons once a day). You must wetten grain prior to mixing Dacovit with feed. - During The Breeding: Twice a week 2 table spoons in 2 litres, approx 40 Pigeons. It is also possible to add DACOVIT into the pigeons feed in the same dosage (40 Pigeons once a day). You must wetten grain prior to mixing Dacovit with feed. Must NOT give the day of basketing! !